Oh boy, it's here. The latest book in Jumping' Jim's Ukulele Masters series has just been released. It's James Hill's Duets for One. 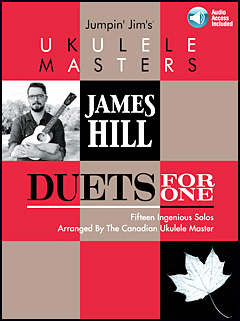 Duets for One advances the techniques that James teaches in the JHUI as well as through his online The Ukulele Way series. It's a style of solo playing that really makes you sound like two players: one on melody, the other on chords and rhythm. The first 50 copies sold on the Fleamarketmusic site are numbered and signed by James. I can't wait to get it.